It's hard to teach children anything. Especially when they are least or not interested at all. The interest of a kid on any topic drives the essential concentration for the child to sit and learn the subject. But how do you improve a child's concentration? The answer lies in induldging kids more in the topic of study. 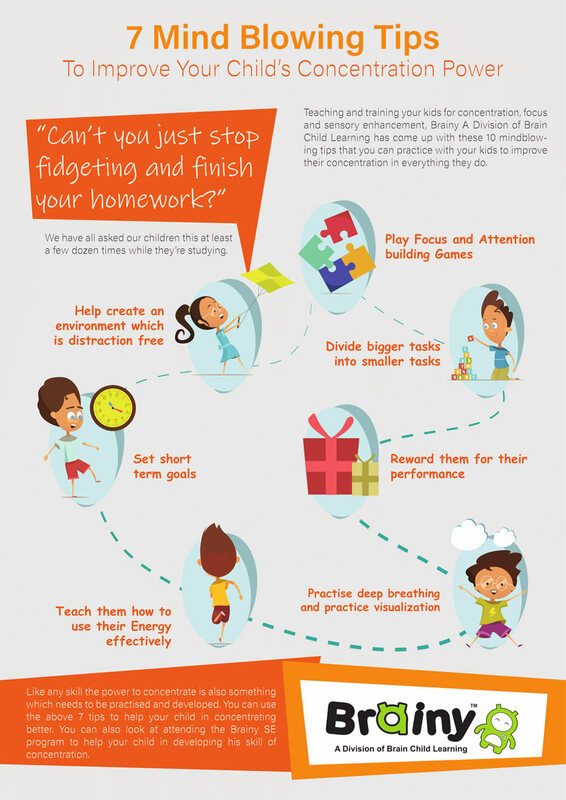 This is an infographic produced by Brainy's years of teaching and developing interst in kids to improve their focus and concentration while studying. Do let us know if the comments if you wish to add on to this. Please include attribution to Brainy.co.in with this graphic. Can We Increase the IQ of Our Child Through Brain Training? Best Memory Training Course - Improve Your Child’s Learning Skills. Educational Franchise Opportunities in India. Are People with Higher IQ better than people with higher EQ. What is More Important – to Succeed in School or achieve Success in Life. Why should we focus on Right Brain Training. The Effect’s of Brain Waves on our Body.